Mr. and Mrs. V. Greenwood, of 91 and 93 Halifax-road, Holt Hill, Briercliffe, have received official information that their son, sergt. W.P.Greenwood, 25206, R.A.M.C died on smallpox on April 2nd in the 19th Stationary Hospital, Port Amelia, German East Africa, where he was admitted on March 22nd. 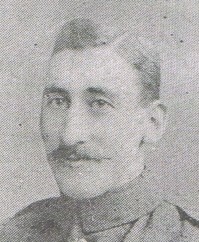 He joined up on ambulance duty on August 7 1914 and was at Netley until December 1916. There he was very popular, and before leaving he was presented by the officers with a silver rose bowl. After being home on leave he went to Aldershot to train for service abroad. He sailed for Africa on January 1 1917. Sergt. Greenwood was single, and was employed as a weaver by the Harle Syke Mill co. He was brought up as a scholar at the Independent Methodist Church, Haggate, where he was an active worker, and also of the Christian Endeavour Society. There are two brothers now serving, and another has been discharged as unfit. The deceased was a member of the St. John Ambulance Brigade, and was on the Home Hospital Reserve before joining the colours. Our church has sustained a very real loss through the death of William Percy Greenwood, which took place on April 2nd, in German East Africa, after ten days' illness. In his infancy a true Christian mother brought him to our Sunday School and Church, and in early years he began to love and serve Jesus Christ. In his youth and young manhood he gave promise of great service for the Master, occupying the positions of teacher, member of the chior, secretary of C.E. Society and Sunday School. Prior to the war he was keenly interested in the work of the St. John Ambulance, and was on the Home Hospital Reserve. On August 7th 1914, he joined the Army on ambulance duty, and was at Netley until December 1916. He then volunteered for service abroad, and on January 1st, 1917, set sail for Africa. Such was the esteem in which he was held at netley that on his departure the officers presented him with a silver rose bowl. As further proof of his sterling character, his parents received on August 20th over £23 from his comrades in East Africa as a "small token of respect." For 3 1/2 years he thus served in the hospitals attending to the wounded and the dying. We believe he has earned the Master's reward: "Inasmuch as ye have done it unto the least if these, ye have done it unto Me."